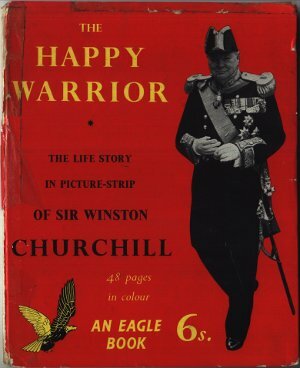 The Happy Warrior, The Life Story In Picture-Strip of Sir Winston Churchill is a mixture of black and white photographs of the great man, along with 48 pages in colour. The foreword by the Editor of the Eagle, Marcus Morris, states "It is impossible to do full justice to the life of this great Englishman. His activities and achievements throughout a long life are astounding. Soldier, journalist, historian, artist, politician and the saviour of the Western world in those dark days of 1940 when Britain stood alone." A selection of black and white photographs introduce a young Winston and his close family. Following these are the picture-strip highlighting all the major events from Churchill's life from birth through to his resignation from parliament in 1955. The final few pages show more photographs, but this time they are from the the second World War, with the last photograph showing Churchill broadcasting to the world that the war with Germany has been won. Dimensions : 26cm x 32cm with 64 pages. At Harrow, young Winston was not very good at Latin, but excelled at English. His early career in the Army took him into action in Havana, Cuba, then in Omdurman. The Boer War sees Churchill as a War Correspondent. Success in politics puts Churchill as First Lord of the Admiralty by 1914. Churchill is asked to form a Coalition Government during World War 2. After the fall of France, the Battle of Britain follows and Churchill sees England in its Finest Hour! 6th June 1944, D-Day, the greatest invasion in history!